Recently, I was playing with CNTK object detection API, and produced very interesting model which can recognize the Nokia3310 mobile phone. As you probably already know Nokia3310 is legendary mobile phone which was popular 15 years ago, and recently re-branded by Nokia. testing custom image in order to detect Nokia3310 on image. Finding appropriate images for our model is very easy. Just go to google.com and type "Nokia3310" and bum, there are plenty of images. Find at least 20 images, and put into the Nokia3310 image folder. Once we collect enough image for the model, we can move to the next step. train roi file - which contains "region of interest" data. The data is consisting of list of 4 numbers which represent the top, left, right and bottom coordinate producing rectangle of the object. Seems pretty much job for simple object detection, but hopefully there is a tool which can generate all data for us. It is called VoTT: Visual Object Tagging Tool, and it can be found at : https://github.com/Microsoft/VoTT. ## Generating Image data with VOTT Here we will explain in detail how to generate image data by using VOTT tool. Open VOTT tool, from File menu and select folder we previously collected with images. Then for each image, make a rectangle on each object which represents the Nokia3310. Once you finish with tagging for one image, press Next, and do the same for all selected images. Once the process of tagging is finished, then the export action can be performed. c) testImages - contains approximate 30% of all images which we tagged Nokia3310 object, and this folder will be used for evaluation and testing the model. The VOOT classified all images in three folders. In case there are images with no tagging, images will be moved to negatives, all other images is separated into positive and testImages folder. -[imagename].bboxes.labels.tsv - which consist of all labels tagged in image file. -[imagename].bboxes.tsv - rectangle coordinates of all tags in the image. Once we have VOTT generated data, we need to transform them into cntk format. First we will generate: class_map file.txt. The content of the file is list of all images placed in positive folder, with ID on the left side and zero on the right side, separated by tabulator. Image path should be relative. As can be seen blue text is rectangle coordinate, which folow the red number indicates classValue. Since we have only one class 1 is always after 4 blue numbers. Also in case image contains more than one rectangle which is the case of line 3, after every four blue numbers it goes class value. This is procedure how can we make three files for training, needed to run CNTK object detection. Also for testing data we need image and roi files. WHole dataset and coresponded files can be found on GitHub page. So I took the source code from there, and modify it for my case, and published at git hub which can be found here. Before downloading source code, be sure the CNTK 2.3 is installed on your machine with Anaconda 4.1.1, in the environment with Python 3.5 version. Clone the Github repository https://github.com/bhrnjica/ObjectDetection and open it in Visual Studio or Visual Studio Code. First thing you should do is to download pre-trained "Alex net" model. 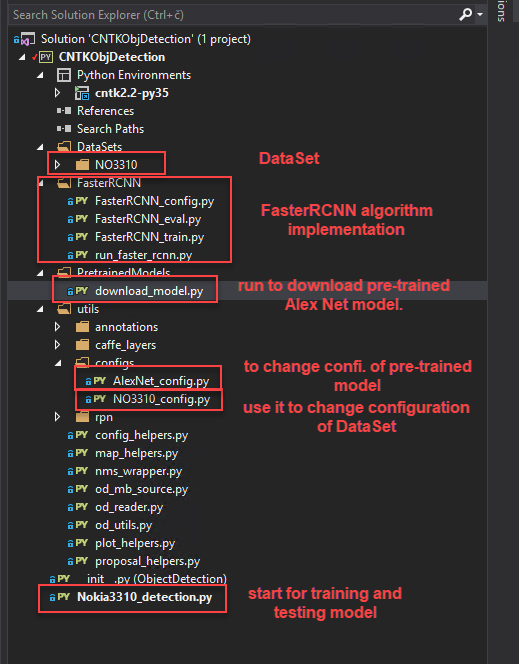 You can easily download it, by running the download_model.py python code placed in PretrainedModels folder. Process of training is started when you run Nokia3310_detection.py python file. Beside pre-trained model, no other resources are required in order to run the project. The folowing picture shows main parts of the solution. Once the training process is finished, once image is evaluated and shown in order to evaluate how model is good in detecting the phone. Such image is shows at the beginning of the blog post.